You are known to us! We could take you at any time, but my lords Anubis and Bes would prefer that you suffer! Did you think that there were no consequences for turning your back on your rightful lord Azariel? Bes does not take kindly to betrayal! While you traipse around the jungles of your world we, the servants of the Dark, are taking over the civilized world. I have a proposal for you- join us! Come to Cynopolis, pledge your loyalty to the Gods of Dark, and join the winning side. We of course require that you give us the Finger of Osiris, as a show of good faith. We would monitor you, and if proven worthy, give you a place in leadership. We would of course monitor Azariel and Overkill closest, as they have both shown that they are fickle in their choices of gods. Speaking of the dwarf, Mary looks good here, dressed as a wife of Bes! You can be reunited with her when you come join us. Her pitiful protector was defeated easily- and the clan of the Redbeard have been reminded of the power and glory of Bes! Oh, and Overkill, by the way, Patch was Bes, and he accepts your worship, as well as your cousin’s, King Minischmee! If your beloved king wishes to rule he will need the help of a God that is Alive! I expect you all to turn back, sail to Cynopolis, and give yourselves to the winning side. If you are not seen on the docks of Cyclone leaving within 2 weeks time, you will have sealed your fate. Who am I? Just the one that will ensure your doom, and my Gods triumph, if you do not obey. We shall meet soon. I have taken one of CrIsis already- all of you are child’s play! 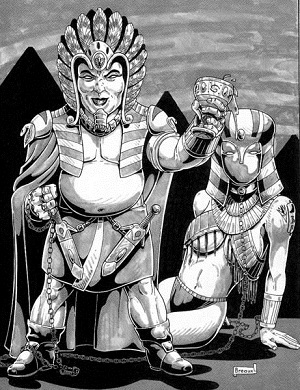 Picture of Bes from Wayne Breaux and Palladium Books.